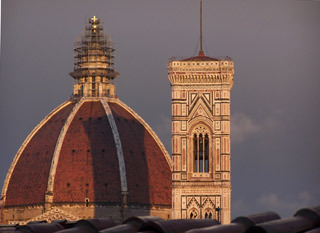 Firenze is our city of peace and comfort. This year we included a couple of short stays for wandering the ancient streets and taking in the daily life on both sides of the Arno River. We noticed no dramatic changes disturbing the historic harmony of the town plan or architecture. The Eurostar train service from Roma to Firenze is frequent and fast (90 minutes). With our Trenitalia passes from Rail Europe in hand, we enjoyed the first class comfort of wide, adjustable seats and plenty of leg room. The complimentary beverage and snack service was very welcome as was the ample storage space for luggage and the clean up-to-date toilets. We were delighted with our stay last year at J.K. Place, Piazza Santa Maria Novella #7, so an encore was definitely in order. It's only a 5-10 minute walk from the Santa Maria Novella train station. Much of the renovation that was underway in the square last year was still in the works, but it doesnt detract from the stunning white and green marble Gothic-Romanesque facade of the Chiese e Museo of Santa Maria Novella. It's not unusual to return to a hotel or restaurant that was a joy the first visit only to be disappointed the second time around. This was not the case at J.K. Place, which was wonderful, exactly as we remembered it. The same staff was on hand to welcome us with the same enthusiastic spirit and hospitality that had spoiled us last year. Perhaps the black wooden floor of the entrance corridor had a bit more shine, but the Lounge, a smashing eclectic mix of classic, modern and high tech designer furnishings in luxurious soft cream, ivory and gray, was exactly as elegant as we recalled. With 20 staff members for the 20 rooms, there is always a smiling face to offer cappuccino and a snack, which was served to us in the TV Room while our luggage was discretely deposited in our bedroom. It had started to rain so it was easy to settle into the comfortable sofa and get caught up on the news on the giant TV on the rear wall while Linda used the laptop on a 19th century oriental table, complimentary for guests. Last year our room was on the first floor so we were happy to use the beautiful main staircase of Pietra Serena that is decorated with plants, art, and sculpture. Alas we were now on the fourth floor, with neat views of the Firenze roof tops, so we reluctantly used the cute elevator just off the reception room which is lined with shelves of books, CD's, DVD's, travel information, etc. Since it was mid-afternoon and the downpour showed no signs of abating, we selected a couple of DVD's to keep us entertained until dinner. Now this was the way to watch a movie; don a thick terry robe, place a platter of fresh fruit and rich dark chocolate (beats popcorn) on the firm mattress of a king bed between you and your partner, lean against cozy pillows, push the remote button and away you go. When we were thirsty, we just slipped into our J.K. slippers and proceeded to the mini bar, always well-stocked with complimentary soft drinks, juices and munchies. Being surrounded by gorgeous furniture, furnishings and accessories compounded the pleasure. The cream-colored, textured marble bathroom was stocked with ample supplies of fine quality soaps, body gel, shampoo and lotions. The bath-shower had about 3 different ways of delivering water to accommodate any possible preference. Whichever we chose, the luxury terry towels gently dried us off. Last year we had a marvelous traditional Florentine steak dinner at the Lounge Restaurant next door to the hotel. We remembered that the menu had an interesting list of contemporary dishes and since it was still raining like mad, where to eat was an easy decision. The environment is elegant relaxed supper club with service to match, a perfect spot for a romantic dinner after spending the afternoon in bed. The house offered a serving of smoked salmon and cream cheese which was a treat with the excellent bread selection. The menu offerings were tantalizing, fish choices won our hearts. Starters of stewed baccalà with chickpeas and sage and potato tortelli with gorgonzola la fondue with orange and endive were beautiful to look at and delicious. Our waiter suggested a white wine from Umbria near Marche, Pallio di San Floriano-Monte Schiavo, which was a fitting medium dry accompaniment to our chosen meal. Linda's fish of the day, ricciola, was prepared with capers, spinach, lemon and olive oil and served with heavenly mashed potatoes. 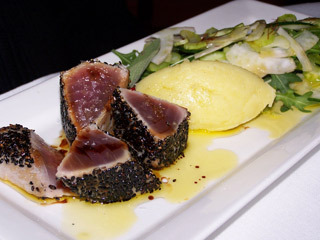 My Sicilian rare red tuna filet was done in a crispy blackened sesame crust and served with an aromatic salad and, thankfully, the mashed potatoes. Fish preparations do not get any better. Dessert of fresh fruit with ice cream and sorbet was a fitting finish. J.K. Place and the Lounge is a pairing of equals. What had been the internal courtyard of the original house is now the glass-domed Breakfast Room. Guests are seated in the center of the room at a 19th century walnut table, decorated with attractive and unusual adornments as well as fine quality dishes, cutlery and glasses. Breads, fruits, cereals and pastries are presented on a lovely sideboard from which guests serve themselves. Linda ordered bacon and eggs and was rewarded with two large-yoked beauties and bacon done perfectly crisp, as ordered. I looked on in envy, comforted in the knowledge that we were staying another night and Id get another chance to throw my cholesterol caution to the wind. The weather improved to occasional showers so we were able to get out and stroll the city. There seemed to be more tourists around than usual for this time of year. Digitals were on fire at the Duomo, Piazza Della Signoria around the Palazzo Vecchio, Galleria Degli Uffizi and Ponte Vecchio. The Santa Croce church in Piazza S. Croce had its share of admirers but it thinned out as we walked along Via di S. Giuseppe to our favorite street Via de Macci. This narrow street is always filled with neighborhood residents out shopping here or at the market at the other end in Piazza L. Ghiberti. Business was brisk at the flea market and at the produce stands, while inside the usual throngs were buying meats, fish and cheese, etc. We have had wonderful lunches at the restaurant inside in market, but after the late, ample breakfast, we were not planning to eat until dinner. Someone at the hotel suggested that Trattoria Dante, was a very popular spot for pizza and seafood at reasonable prices. Trattoria Dante was a short walk from Piazza Santa Maria Novella along the Via de Fossi (lined with fine quality antique shops) over the Ponte alla Carraia to Piazza N. Sauro. Dante is at the first corner on the right. The aroma of freshly baked pizzas greeted us as we entered the trattoria with its curved brick ceilings, wine bottles, photos, blue-white checkered table cloths and young enthusiastic staff. Did I hear seafood? The spaghetti alla pescatore was as good as it gets. 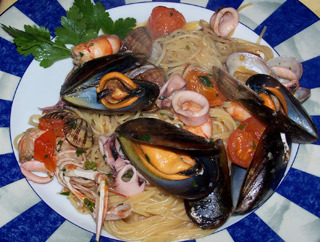 Pasta cooked al dente, very fresh mussels, clams, calamari and scampi tossed with olive oil, garlic, seafood broth and cherry tomatoes. Equally wonderful was grilled whole branzino served with pan fried potatoes and decorated with cherry tomatoes and olives. Let's hear it for the guy at J.K. Place. He had not mentioned dolci, but when we got back to the hotel we told him he could recommend the chocolate pie with confidence. When we walk along Fiume Arno between Ponte S. Trinita and Ponte Vecchio or stand on the bridges admiring the timeless beauty of the scene, we dream how neat it would be to live in one of the apartments overlooking the river. We did the next best thing on our return visit, we stayed in a bastion of old world tradition and hospitality, Hotel Berchielli, a 15 minute walk from the train station. 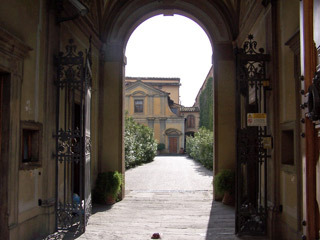 The main entrance and lobby is off Borgo SS Apostoli in the adorable Piazzeta del Limbo, home to the S. Apostoli Church with its many famous masterpieces. The grand marble and granite lobby and fine furnishings define the character of the establishment and the staff brings it to life. The General Manager greeted us at the reception desk and proudly insisted on taking us to our requested room overlooking the Arno. Before I could say thank you, Linda had the shutters and windows open and her camera perched on the tripod. It was a bright sunny day and she was in all her glory recording the intriguing scene. In the evening with the buildings and Ponte Vecchio aglow and the lights reflecting on the water there were other captivating views to capture. This large beautifully furnished twin bedded room with an oversized upholstered chair, desk and chairs, and good size bathroom with all the amenities was perfect for us to give our dream a short run of reality. The hotel is an amalgamation of adjoining houses; the corridors lead in several directions at various levels. Theres a room for every taste and a lovely roof garden for enjoying a beverage or snack, weather permitting. There is complimentary internet access in the lobby for guests, which was one reason to get us out of the room. The others were to stroll the ancient streets of the Oltrarno (other side of the Arno) and, of course, to eat. 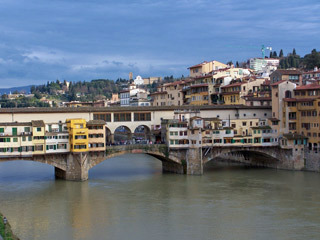 Living next to the bridges, it was very easy to slip into the labyrinth of lanes and precious squares of the Oltrarno. In 1343 the city was divided into four quarters, named after the most important churches. The Oltrarno quarter was named Santo Spirito which was subdivided into 4 Gonfalons: Drago, Ferza, Nicchio and Scala, which differed in size, population and local customs. The Drago and Ferza Gonfalons were highly populated by the wool guild workers and craftsmen and to this day the artisans who have preserved the skills and working methods of their ancestors work diligently at their craft in the lanes, alleyways and piazzas. We never tire of patrolling these ancient ways to appreciate the patience and diligence it takes to preserve the quality of the techniques and craftsmanship. It's a real-life working and living neighborhood with the sounds and smells to prove it. Crossing Ponte Alla Carraia we turned right on Borgo San Frediano past shops where paper products, pottery, leather accessories and hand made shoes are crafted to order. At the end of the street we came to Arnolfo's old walls, the Torrino di Santa Rosa and the spectacular city gate of San Frediano, built in 1334. Still in place are the huge nail-studded doors and iron rings. Nearby we were attracted by the entrance and gardens of the Chiese e Convitto di San Francesco di Sales and wandered inside to have a look. A fellow working on the grounds hurried over, waving his broom, and ordered us out. Built in 1700, the church and girls boarding school would seem to be off-limits to visitors. Just south is Piazza de Nerli, Via dei Cordatori, Via dei Tessitori and Via del Drago d'Oro which form a square of antique dealers, resale shops, blacksmiths and bronze workers. Via Camoldoli is named after a 12th century convent on the street which is now home to health facilities, artisans' shops and warehouses. Continuing east on Via del Campuccio toward Via dei Serragli, the north-south street that divides Drago and Ferza, is the Torrigiani garden, the largest private park in Firenze. Turning on Via dei Serragli towards the Arno, there are many fine old palazzi and numerous heritage shops. At the end, between Borgo Stella and Borgo San Frediano, is the large Palazzo Del Pugliese with an attractive courtyard and garden. Borgo Stella leads into Piazza del Carmine and the ancient church of Santa Maria del Carmine with its famous frescoes in the Renaissance Brancacci Chapel and the masterpieces by Foggini and Giordano in the Baroque Corsini Chapel. A woman we met in the Hotel Delle Muse in Rome who has a home in Firenze, told us her favorite restaurant in the city was 4Leoni also known as Quattro Leoni and Four Lions - something for everyone. The folks at our hotel confirmed that it was very good and made reservations for us. It is located in Oltrarno in Piazza Della Passera. From the Hotel Berchielli, we crossed the Ponte S. Trinita and took the 2nd left on Via Dello Sprone which led right into the charming Piazza. The restaurant has a large outdoor patio which dominates the tiny square, a glorious setting for dining in fine weather. We loved the casual rustic environment inside, with exposed stone and brick and multi level dining rooms. The young, affluent crowd said "hot" restaurant but our waiter was overbearing, overselling and frankly, obnoxious. He offered a prosecco, which we happily accepted on the incorrect assumption that it was a complimentary aperitivo, quite common throughout Italy and tried like hell throughout the meal to sell us more water. He had better luck with the expense account customers. 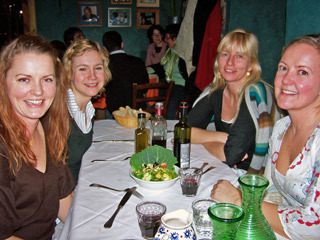 Our dining experience was saved by an enjoyable conversation with four Swedish beauties at the next table. Linda started with the pasta recommended by our friend in Rome, fiocchetti di pera in salsa di taleggio with asparagi. The pocket of floral shaped pasta was filled with pear and bits of asparagus in luscious cheese sauce. I had tortelli mugellani al sugo, potato filling with a meat ragu. Both were outstanding. We shared two excellent mains, Peposo all imprunetina, tender chunks of meat stewed slowly in wine and pepper, and gran fritto dell aia, a mix of fried chicken, rabbit and veggies. The house red wine and the chocolate cake were harmless. 4Leonis prices are fair so its a good value choice. Hopefully the service will be less pushy next time we visit. We crossed Ponte S. Trinita to continue our voyage through the quarter of Santo Spirito, Antico Gonfalone della Ferza, starting right at its heart. Via del Presto di San Martino, home to wood and copper artisans, runs alongside the Basilica di Santo Spirito, which sits majestically in its namesake piazza. Adjacent is the Baccio d'Agnolo bell tower, the landmark of Oltrarno. The 14th century trussed-timber refectory contains part of a "Last Supper" painted by Andrea Orcagna. This is the perfect piazza. Pretty trees shade the restaurants, cafes, bars and artisan workshops creating a social and working conclave. Of particular interest was the number of hat making workshops. There are many interesting shops to be found on Via Santo Spirito, from antique dealers to leather, silver and wood craftsman. Important palazzi of the Machiavelli, Vettoi, Manetti, Pitti-Bocciolini families grace the street along with the Palazzo Frescobaldi with its private balcony facing onto the interior of the church of Santo Spirito. Behind the Frescobaldi and Manetti palazzi, next to the apse and bell tower, is a bright, fanciful garden that should be seen. East of Ferza is Antico Gonfalone del Nicchio which runs between Ponte S. Trinita and Ponte Vecchio. Ponte Vecchio, the bridge that escaped WWII without harm and the floods of the Arno, started its charmed life housing workshops of butchers and greengrocers before it became legendary for its goldsmiths and jewelers. The incomparable Pitti Palace and the Gardens of Boboli is located on Via Guicciardini. Across the way are wonderful workshops of specialty paper and mosaics as well as bookshops and dealers in elegant antiques. The sweet small square where we had dinner last night, Passera, is a crossroads of old streets and lanes, where you will find wood carving, metal and wrought iron working and frame gilders. The oldest and loveliest street in Firenze, Borgo San Jacopo, linking the two bridges, has both elegant buildings and very excellent dining choices. While on our walk thru Piazza del Carmine yesterday we noticed the Trattoria Del Carmine, which had the friendly neighborhood trattoria appeal. Tonight we would put our antennas to the test. It was a good thing we had the hotel make a reservation as the three dining rooms were packed. Carmine, the owner, greets his customers and works the tables with his staff. No hard sell or pretensions here, just good folks making everyone feel at home. Passing the immaculate open kitchen on the way to our seats, we waved and wished 'buona sera' to the chefs who reciprocated our greeting. Carmine was pleased to help us make our choices. 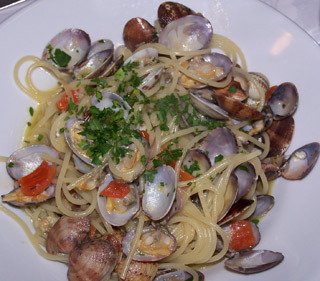 Linda loves spaghetti alle vongole and the boss assured her the clams were fresh and she would be pleased. Pleased, no, thrilled would be more appropriate. Loads of plump clams resting on al dente pasta with a simple tomato, olive oil and parsley dressing made a sweet beginning for the perfectly grilled orata that followed. The firm-fleshed, crisp skinned beauty was filleted tableside and misted with olive oil. My penne alla cernia, sauced with tomato, flakes of the firm white fish, olive oil, parsley and pepperoncini was followed by medaglione di vitella, ground veal patty, in artichoke sauce. I could have been very happy with another order of the penne but then I would have missed out on the marvelous marriage of minced veal and fresh artichoke; individually the flavors are special, together, awesome. Only an authentic traditional cucina can prepare such a meal and then top it off with fresh limone ricotta pie. The house white wine was quite delicious as was the limoncello and grappa to finish. The prices are extremely reasonable for the quality of preparation and kind service. We always seem to find new reasons to return to Firenze!